In this guide we will show you how to get a Chinese IP address with a VPN. To do so you will need a VPN with Chinese servers, these are few and far between given the Chinese government’s attitude to VPN companies. China may have the highest number of internet users in the world – with an eye-watering 731 million people connected to the web – but the reality is that its version of the internet is restrictive and walled off from the globe. A plethora of common Western apps such as Facebook, Google, Tinder, and streaming news sites simply don’t work if you log in from China. That’s why VPNs are so popular with foreign expatriates living in China as well as local citizens trying to access Western content. Having said that, some users may still want to obtain a Chinese IP address. Chinese video streaming sites like Youku offer a ton of free-to-stream Western media content including popular movies and TV shows. This collection is out of bounds for users logging in from the UK, US, or Canada – a Chinese IP address is essential. Chinese citizens working abroad or vacationing may also be in need of an IP address from back home to access other China-only websites such as Renren or banking services. Unfortunately, most well-known VPN companies don’t offer servers in mainland China. A regulatory requirement compels such services to register in the Middle Kingdom and comply with local regulations before setting up shop. What’s the best VPN for a Chinese IP address? 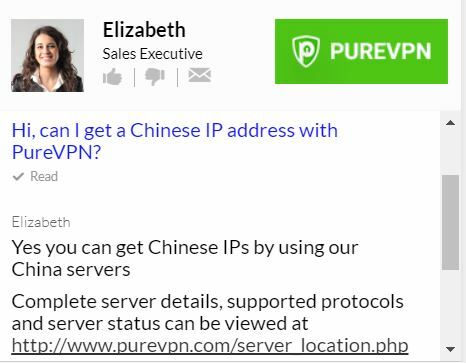 Our recommended choice for obtaining a Chinese IP address is to sign up for PureVPN. It has a robust selection of servers across the world – with 141 countries covered and a sizeable 750+ servers to choose from. There are six servers present in mainland China. The VPN service ranks well on privacy settings – making it clear that it does not monitor user activity or maintain any logs. This means there’s no record of the sites you visit – the only rudimentary data capture is the time you signed in and the server you connected to. Encryption protocols are strong too – the service offers PPTP, L2TP, SSTP, SSL, and 128-bit encryption. A VPN kill switch is included. Users will be pleased with the fact that there’s a live chat option which should help in case something goes awry. Best VPN for Getting a Chinese IP Address:PureVPN is our top choice. Great for accessing Chinese streaming sites that are usually only available to Chinese users. It has a great app. Privacy and security are high calibre. Reliably unblocks restricted sites and services. Try it risk-free with a 7-day money back guarantee. Are there other VPNs I can use? PureVPN is a provider that we’ve tested and can vouch for its reliability. It’s not our top-rated VPN, but it’s a reliable option for the explicit purpose of snaring a Chinese IP address and we’re confident you won’t go far wrong with it. There are a few other services that claim to have servers in China but we haven’t put them under any form of rigorous testing, although HideMyAss is reported to work well for accessing content in China. I’ve downloaded a VPN. What next? How do I access Chinese streaming sites? As mentioned earlier in this article, Youku is a popular destination for users looking to stream free Western content. There are others, too, such as LeTV, iQiyi, Sohu, and QQ Video. Each site has its own library of content and exclusive licensing rights with Western production houses so the range of titles will vary a bit. The procedure for seamless connectivity to these sites is pretty much the same as outlined in the previous section. 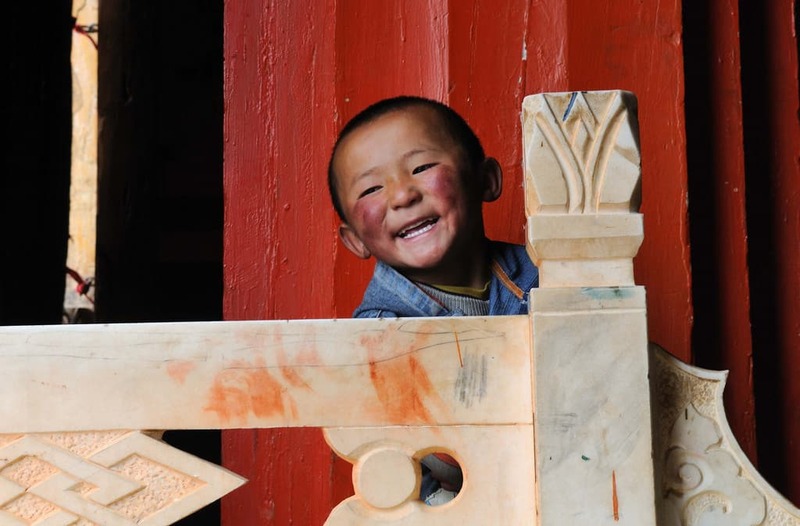 Once you register for a VPN, download the software, access a Chinese server, and voila! China’s Great Firewall is a massive behemoth that’s constantly being fine-tuned by thousands of state-appointed engineers. It’s a firewall at serious scale and not one to be taken lightly. You may come across a free VPN that offers server locations in China but we think you should stay clear of it. That’s because such services have weak encryption standards and poor privacy rankings. You’ll definitely be bombarded with tons of invasive advertisements catapulting the risk of a malware infection. Some free VPN providers have also been caught forcefully inserting tracking cookies in browsers, mining user data, and selling it for a profit. The last thing you want is for your privacy to be invaded while trying to obtain a Chinese IP address. Free VPNs simply don’t cut it. Can I use a Hong Kong or Taiwan IP address to access content from mainland China? The short answer is probably not. Youku started blocking users from both Hong Kong and Taiwan back in 2009 – a condition which still exists today. Other streaming video sites such as LeTv, iQiyi, Sohu, and QQ Video have similar restrictions, so, unfortunately, the only way is to obtain a Chinese IP address. Which sites are only accessible in China? Here are some sites and content that can only be accessed with a Chinese IP address. Please note that this shouldn’t be treated as an exhaustive list as new ones could appear anytime.